WELCOME TO CITY SESSIONS! Check out our Cannabis Tours below that will take you on a MILE HIGH experience you will never forget! Our expert guides will educate and introduce you to the craft cannabis culture that is unique to Denver, CO. We offer boutique bus tours, private tours for new consumers, medical consumers, industry investors and recreational consumers including bachelor/bachelorette parties and corporate retreats. DISCOVER DENVER’S CANNABIS SCENE TODAY! Looking to consume with discretion? The PAX 2 is a discrete, classy, high end portable flower vaporizer that puts off a flavorful and clean vapor that won’t burn your throat. Check out SESSION #14 to see how to use the PAX 2 and why City Sessions gives it the Seal of Approval! The VOLCANO VAPORIZER is a staple at the City Sessions Lounge. This table top vaporizer unit offers a full flavor profile of your flower without the smell. Check out SESSION #18 to see how to use the Volcano Vaporizer. The PAX 3 is the best dual use vaporizer for both flower and concentrates. This unit offers a flavorful and clean vapor that won’t burn your throat. Great for inside use or on the go. The X-Vape Vista is a quality portable concentrate e-nail featuring a quartz heating element, 4 temperature settings and dual functions. Also has attachments for almost any 14 MM or 18 MM male or female water pipe. A vaporizer is a great way to achieve the high you are looking for without the smell of burning buds. 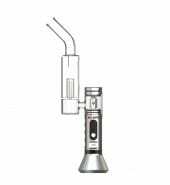 By heating cannabis at a lower temperature than combustion, a vaporizer produces a vapor (not smoke) that still contains active THC and cannabinoids.